Persistence allows you to persist the data in any NoSQL store like HBase or Cassandra. Indexing allows you to index the data in Solr or Elasticsearch. You can specify the persistence store configurations at the group level. For Cassandra: Prefix is “ns_”+tenantId+”_” in persistence Table Name Expression. For HBase: Prefix is “ns_”+tenantId+”:” in persistence Table Name Expression. If the store is HBase, you can specify Region Splitting Definition and HBase Region Boundaries. 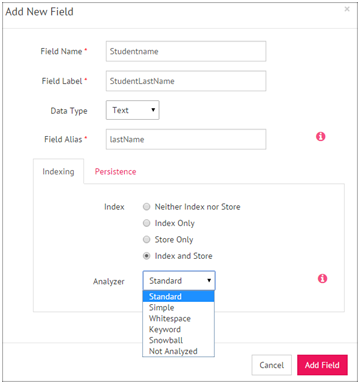 You can specify the Index store configurations at the group level. You can also enter the target index name using an expression, and can enable replication, shards, full text search and custom routing. Additionally, you can enable source if Elasticsearch is configured as the Index store. Custom Routing Policy: It is chosen if custom routing is required for indexing data. It enables the routing policy as well. You will have to specify the routing policy for the sharding data across shard. Where, “0” is timestamp from where routing policy will be effective. This value is 0, it means routing policy will be applied for timestamp greater than 0. Here “name” is field name message for which routing policy will be applied. Here define relative weightage of field’s values, on that basis sharding key will be calculated for querying and indexing. Source Enable: It is enabled only if indexer.type=elasticsearch. It stores the actual JSON that was used as the indexed document. It is not indexed (searchable), just stored. Where, GroupName, is the name of the group, timestamp, specifies the alias name of the timestamp column to be created while creating the message. You can configure every field of a message for Indexing and Persistence purpose. By default, all fields are marked for Indexing and Persistence. Once you decide your choice, it can’t be over-ridden for the same message definition.